Post Graduate Diploma in Management (PGDM) or Post Graduate Programme in Management (PGPM) or Masters in Business Administration (MBA) are all management courses at Master’s level. Both the courses have a commercial orientation and it’s difficult to differentiate between the two. While both the courses have same outcomes in terms of employment prospective, there are some subtle differences. At the end of PGP and PGDM course, candidates are offered a Diploma. However, at the end of an MBA programmes, candidates receive a degree. nd sometimes even elective subjects) will be pretty much same in two MBA colleges under the same university. However, PGPM or PGDM courses are determined by the individual institute. This gives a certain flexibility to the course curriculum. Syllabus undergoes a change according to industrial requirements every year. Universities tend to lag behind and change their syllabus after a few years. “For people who are interested in the corporate world or want to be an entrepreneur, PGDM would be a more suitable choice,” further says Mathur. Since PGP or PGDM courses are offered by autonomous bodies, students need to be careful while taking admission. Many smaller colleges and institutes make claims or do not have proper accreditation status. MBA degrees are conferred by varsities, and hence there’s a lower chance of fraudulent claims. Both MBA and PGDM courses have common core subjects. However, some experts claim most MBA courses focus more on theoretical and technical aspects of management rather than adopting a practical approach. PGP or PGDM courses have an industrial orientation and focus on skills based on market requirements. It has been observed that most MBA courses have lower tuition fees as compared to PGP or PGDM courses. This may be so because mostly government approved universities offer MBA degrees. These universities receive financial aid and grants from the government, making the degree cheaper for the student. In case of a PGP or PGDM degree, students have to bear the cost of the entire programme. However, this is not an ironclad rule. There are MBA degrees which charge high tuition fees (such as IIFT). 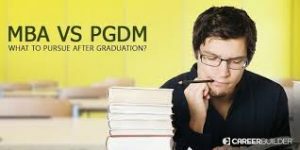 What is the difference between PGPM and PGDM? PGDM (Post Graduate Diploma in Management) is a diploma degree issued by AICTE (All India Council for Technical Education) recognized institutions in a 2-years full-time program. B-schools offering PGDM course are autonomous bodies with industry-oriented curriculum which allows them maximum flexibility to constantly keep updating their course curriculum adapting to the industry development. It is at the par with the quality of education imparted on students pursuing an MBA degree. PGPM (Post Graduate Programme in Management) is not a degree but a certification course. It is a typical 1-2 year’s program, and doesn’t possess any sort of recommendation as it is generally offered by colleges without affiliations. The biggest difference is that PGDM enables you to pursue higher education like Ph.D but a PGPM program doesn’t facilitate you the same. India, more and more students are opting for management studies. There is no dearth of institutes and universities offering postgraduate programs in management. In fact, Delhi & the NCR regions have close to 3,500 management institutes offering a wide range of courses all under the same academic bracket –MBA in Delhi. However, Indian students often find themselves faced with the choice of two such courses, namely MBA and PGDM. Candidates are often unsure about the difference in titles as well as content. This leads to much confusion regarding which course one should opt for, and why. 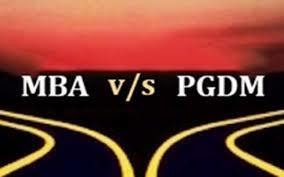 Here’s your guide to understanding the difference between the PGDM and MBA courses in India. Although both courses essentially train you for managerial and leadership positions, there are quite a few technical differences. Perhaps the most striking among these are the formal names of each. What is MBA? – MBA, short for Master of Business Administration, is a post graduate degree. On the other hand, PGDM, which stands for Post Graduate Diploma in Management, is in fact a diploma. Check out our popular post on one year MBA programs. As mentioned earlier, while both courses aim to train you in management and administration, their approach differs significantly. While an MBA course tends to be more theoretical, a PGDM focuses on the technical aspects, providing exposure to real-life business situations. Also, a PGDM is very different than a one year PGP offered by many private institutes all across India. Another advantage of a PGDM is, as it is offered by autonomous institutes, the curriculum can be upgraded more frequently to include the new changes and trends in business management. However, if you wish to pursue higher education abroad, a PGDM is considered to be a diploma, while a university-affiliated MBA is counted as a degree, giving you a better standing. In India, as well as overseas, both MBA and PGDM courses are regarded as having equal value when it comes to career prospects. Having a PG diploma instead of a degree is certainly not considered to be a drawback. In fact, it is the reputation of your university or institute and more importantly, your professional capabilities that truly matter. Now that you have a better understanding about the differences between the two programs, evaluate the courses and choose as per your academic and professional preferences.